Ibrox Noise: Could Rangers make controversial double signing from Championship giants? Could Rangers make controversial double signing from Championship giants? 28-year-old, 6’ 1” Sheffield Wednesday striker Jordan Rhodes is believed to have Stevie Gerrard’s interest to secure him for the right money. He has experience and a decent scoring record having played for Ipswich, Oxford, Rochdale, Brentford, Huddersfield, Blackburn, Middlesbrough and now at Sheffield Wednesday. At only 18, Jordan went on loan to Brentford (remember them?) in League Two and played in 14 games and scored 7 goals. A magnificent achievement for such a young striker. 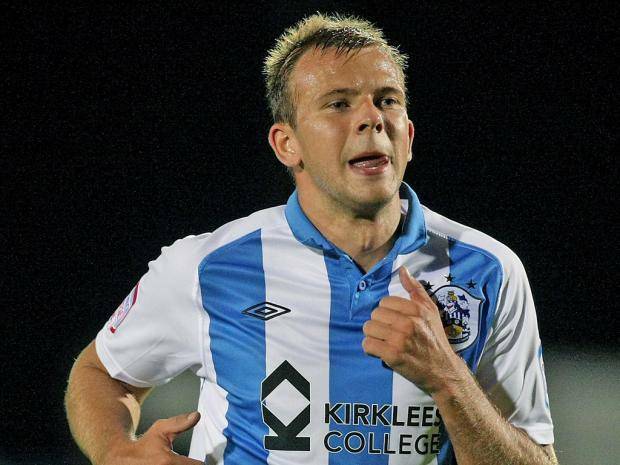 In the summer of 2009 League One side Huddersfield Town paid £350,000 plus an agreed sell-on fee to sign Rhodes. In season 2011–12, he was top scorer in England with 36 league goals, breaking the Terriers’ scoring record. He played in 148 games and scored 87 goals before his 4-year-contract ran out. Rhodes moved to Blackburn Rovers in 2013 for a club record of £8m and became POTY scoring 28 goals in his 1st year in the Championship. On 19 Apr, ‘15, Rhodes was in The Football Manager Team of the Decade Awards. Wow, what an honour! A hot striker in July 2015, Blackburn rejected an offer of £10m from Middlesbrough, and Jordan played a total of 169 matches scoring 85 goals for the Ewood Park side. On 1 Feb, ‘16, Rhodes signed for Middlesbrough, on a four-and-a-half-year deal for £9m. He played in only 18 matches and scored 6 goals in his 1st season, although his team did go up to the EPL, where he only managed to play in 6 games without scoring. On 1 Feb, ‘17, after only a year at Middlesbrough, he moved to Sheffield Wednesday, on loan for 4 months. It was successful and Jordan signed on a permanent basis on 1 Jul, ‘17. Two bosses in a row failed to use him and he scored only four goals in 28 matches. Born in England, Rhodes opted to play for Scotland and played for both U21’s and as a full internationalist. So while it seems clear Rangers are interested in Wednesday’s Rhodes, could another controversial signature be on the cards from the same team? With Rangers’ need for decent defenders, Stevie G has been linked with West Ham’s James Collins and Reece Burke, Brighton’s Connor Goldson and Swansea’s Kyle Bartley – but three of them will cost a chunk of cash. However the next gentleman has been suggested in some quarters as a possible addition too. Glenn Loovens, the 6’ 2” 34-year-old ex-captain of Sheffield Wednesday, confirmed he has left the Championship side at the end of his contract. Over a four-and-a-half-year period for the Owls he played in 150 matches and gave incredible service on and off the pitch between 2013 -18. When he was younger and after a successful loan spell with Cardiff City in the Championship, Loovens turned his loan into a permanent move and played 113 games between 2005 – 08. In the summer of 2008, Glenn transferred to Scotland with Celtic for about £2.3m where he won a title, one Scottish Cup and the Scottish League Cup. He played in 89 games for our bitter rivals during a four-year stay which ended in 2012. He played 6 games for the Dutch U21’s and managed to achieve his dream of playing twice for the full international team. In 2009, he started in his debut match in a 3-0 victory over Japan. Glenn finally left Celtic in 2012 (yes, a fair old while ago) to play 24 times for Real Zaragoza in La Liga, the top Spanish league and he coped well against some of the best forwards in the world. In 2013, Sheffield Wednesday brought him back from Spain to play in the Championship. They were in trouble in second bottom place when Loovens joined the club. He became their captain in 2014 and was the backbone of their defence right up until last week. Should the ‘Gers consider adding Loovens’ experience and defending ability because he is free to sign? Would the fans accept an-ex-Celt playing for the blues? He is an older defender that could certainly do a good job for whoever signs him. Landing the right 2 or 3 central defenders is going to be paramount to Rangers mounting a real challenge to Celtic this season, and Loovens may help to steady the rocky defensive problems of the last few seasons. Do you think Gerrard should consider luring Glenn Loovens to join him with his brand new Rangers revolution on top of the interest in Rhodes? Sign Cummings and another top ST! Sat opposite a Wednesday fan. Hes offering to drive him up. No to both. Not good enough. If we sign Loovens the club will have my ST to re-sell. Get Bartley back as soon as possible. Saw him a lot when at Leeds and was a standout.The experience he’s gained combined with his winning mentality will help galvanise our defence. Saw Bartley on numerous occasions whilst at Leeds. Sign him now. The lad knows the score about the expectations at Rangers and his experience and winning mentality is what we need. Rhodes would be a good signing. He scores goals wherever he goes and I think we've been crying out for a goalscorer as opposed to someone who runs the channels but is rarely in the box (garner, waghorn, Cummings and Morelos to a small extent). Glenn Loovens? Nearly choked on my dinner there. He was one of my favourite Celtic defenders along with Efe. He's mince! Like I have said in previous articles, I will await till the management are in place and until players have actually signed on the dotted line before I give my point of view of our chances of winning the league next season. That said, all the players Ibrox Noise have mentioned reek of mediocrity on top of both signings already made! We would never win the league with the players you are suggesting, you need to up your quality in player if we want to win the title! I'm hoping Mark Allen and Stevie G will be looking to bring the required quality of player that will beat the beggars next season. Oh, as for your title "Championship Giants"?? give me a break!!! I suggest you set your standards and sights much higher to match the status that our team deserves! It's EPL standard of player or similar elsewhere we should be looking at. I'm concerned that our 6 man scouting department established by Mark Allen in January do not appear to have ventured outwith the UK. We need to be shopping in Scandinavia, Easter Europe and the like for rough diamonds. Even Carlos Cuellar, La Liga Player, cost only 2m but sold for 8m. The club needs value for money and you really don't find it in England. Loovens legs have gone. Was being run ragged in the championship. Was great when he first came but now been found out regularly. Rhodes may or may not do well. Too much pressure on him at Hillsborough with the price tag added to the fact we had a manager(clown) called Carlos who had no idea how to get the best out of him. Basically his confidence is shot. Good luck for next season whatever happens. Keep the blue flag flying high.